Zingtree’s decision tree platform makes it easy to offer your end-users an interactive way to find answers, optimize workflows, and a whole lot more. Below, we’ll walk you through how to make a basic decision tree using our most popular methods of creation in order to help you get a closer, step-by-step look at how it’s all done. The Wizard is our most-used creation tool, offering simple prompts to build your tree, question by question (and answer by answer). It’s one of the easiest ways to work through an accurate flow for your customers or users. 1. Log in to your Zingtree account, go to My Trees and select Create New Tree. Choose the option to fill out forms with the Zingtree Wizard. 2. After naming your decision tree, choosing your ideal display style and providing a description, just click the Create Tree button to move on to the next step. 3. Once you start the Wizard, you’ll see an entry screen that will prompt your first question and answer options, along with some main body content to give users context. When you’re finished setting up your first question, click Save and Continue. 4. You’ll next be asked to fill out an unfinished part of your decision tree. Click to Offer a Solution, and fill out the form presented to you. Since this is a solution node, you won’t need to ask any other questions. Click Save and Continue again when you’re finished. 5. Next, you’ll continue to fill out more questions and answers to reach the end paths of your decision tree. For a greater selection, try providing more answer choices. 6, Next, you’ll see a page with an overview of the sequence you’re building. In this case, choose to Offer a Solution. This will be the end of one of the paths in your decision tree for your end-user. 7. Continue to complete the rest of the forms that the Wizard prompts. When you’re all done with the interactive building process, the Overview page will appear to show you every node and path in an easy-to-digest way. Watch our tutorial video for more information about the Zingtree Wizard. The Designer tool is another great way to create decision trees in a more visual way. Presented in a whiteboard-style screen, you can easily build out every node, connection, and pathway while being able to see a high-level overview the whole time. 1. Log in to your Zingtree account, go to My Trees and select Create New Tree. Choose the option to visually draw out your decision tree with the Zingtree Designer. 2. Once you start Designer, you’ll see the white board-style screen like the one shown below. Click on the green box for Node #1. This will be your starting node – the very first page your end-users will see. 2. Next, you’ll see an edit window appear on the right-hand side. Change the Title, Question and Content areas to fit your tree needs. Next, add another question by dragging a New Question node into the drawing area. Click the green box for the new question node, and edit it like the first time. 3. Drag a Final Answer node answer node into the drawing area, and edit it. You can drag as many question and Final Answer nodes into the Designer drawing area as it makes sense for your needs, and label them respectively. 5. After adding the question and answer nodes to your decision tree, it’s time to link them together. Hover over node #1 until you see a large dot appear, then drag it over to its connecting node. Watch our tutorial video for more information about the Zingtree Designer. No matter the route you take to get there, you’ll end up with the same stunning, super-powerful decision tree. Click through our demo trees within the Gallery to check out even more. You can also use Google Sheets or Excel to begin building your decision tree in a spreadsheet format, then importing it into your Zingtree account to customize, clean up, and publish. You’ll need to first learn more about the specific rules in place for starting the formation of your decision tree in a spreadsheet. In your spreadsheet, select the entire range of cells for your tree, and copy to the clipboard (Ctrl+C or Cmd+C). Choose Microsoft Excel or Google Sheets as the source, depending on what you used to set up. Enter a name for your decision tree. 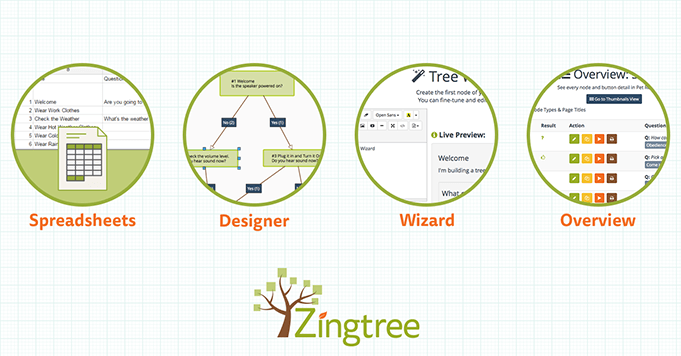 Have any questions about getting started with Zingtree decision trees? We’d love to speak with you anytime! This article was originally published on September 14, 2016, and has been updated to include new creation methods. This looks a really neat and quick way to create decision trees; and I like it can be done both step wise or visually. Decision trees can be embedded on any web page. Here’s an example. Embedding is easy. You can get code from the Publishing Links tool. This FAQ article has details. Try this page (which uses a tree from our demo Gallery) to see the code and play with embedding options.